For the second straight week, the ongoing economic crisis dominated the social media, just as it did the more traditional press. 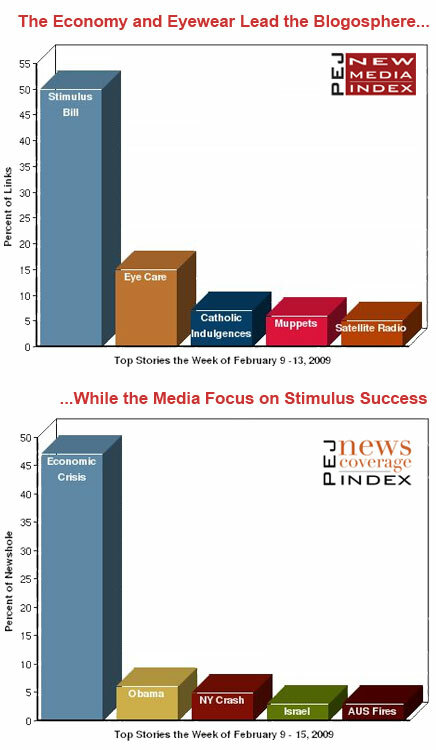 The stimulus package that made it through Congress on Feb. 13 was the subject of half of all the links (50%) last week found in the New Media Index of Pew Research Center’s Project for Excellence in Journalism, which analyzes millions of blogs and other social media sites each week. Many of posts either evaluated specifics in the bill or debated the Republicans’ strategy in opposing President Obama-discussions that mirrored some traditional media commentary, but spent less time anointing political winners and losers. The similarities between old and new media platforms, however, ended there. The next four biggest stories in the blogosphere and other new media revealed an online discussion that diverged dramatically from traditional media news agenda. In the mainstream media, big stories are often evaluated for the breadth of their appeal; in social media, hot topics often tend to energize specific online communities built around narrower interests. The second story in the new media last week (accounting for 15% of the links) was a New York Times personal finance article on how to save money on glasses and contact lenses. The third story (7%) revolved around the return of plenary indulgences to moderate the punishment for sin within many Catholic churches. That was followed (at 6%) by a trip down memory lane with some popular Muppet and Sesame Street characters. Next on the list (6%) was the possibility that the satellite radio company Sirius XM is headed toward bankruptcy. None of these stories received much attention in the traditional press (save for the Sirius XM case). The mainstream press, instead, featured coverage of the new Obama administration, the commuter plane crash near Buffalo, the Israeli elections and the Australian wildfires in its roster of top five stories. These are some of the findings of the fourth edition of PEJ’s New Media Index. The index is an effort to monitor the content appearing in new media platforms. The biggest element of this Index is what appears in the more than 100 million blogs and other social media web pages concerned with national news and public affairs tracked by two monitoring sites, Technorati and Icerocket. Both track the commentary online by identifying what news stories bloggers and other websites link to. Each weekday, PEJ captures the top linked-to stories and analyzes their content. It then compares those findings with the results of its weekly analysis of more mainstream media, the weekly News Coverage Index. The Project also tracks the most popular news videos on YouTube each week. From Feb. 9-13, the number of links focused on the economy (50%) was more than three times as many as the next largest story. The same subject dominated in the traditional press, filling 47% of the overall newshole, according to PEJ’s News Coverage Index. Much of the discussion in the blogosphere last week focused on the contents of the stimulus bill, something new media users had also examined extensively the week before. Now much of the commentary dealt with the GOP’s political strategy, given that the package received only three Republican votes. Senate Democrats cut some spending programs to win GOP moderates, and CNN.com published a partial list of what programs would not get the funding. Online, a good many bloggers were outraged at the items taken off the table. "Instead of doing their part in jumpstarting the economy, they’re doing their best to slice from the bill anything that will support the common people," complained ThePoliticalCat. "Schools? Cut. Hospitals? Cut. Food for the hungry? Cut." Conservative bloggers thought too much remained. "We still should be concerned about WHAT WAS LEFT IN THE BILL," warned bydesign001. The bill’s online supporters found ammunition in a Feb. 8 column by Paul Krugman in the New York Times blasting the so-called Senate "centrists" who negotiated the cuts he said would result in fewer jobs. Some on the left agreed Obama had focused too much on bipartisanship rather than the country’s best interests. "Obama made some really, really bad choices," declared Susie Madrak on the left-wing blog Crooks and Liars. "The Republicans picked up the ball and ran with it…these were serious strategic errors on the part of Obama and his administration, at a time when we can’t afford much delay." Others, jumping on a Feb. 9 Washington Post article quoting Republican lawmakers on strategy, seemed pleased the Republicans Party had stood almost unanimous in opposition and was regaining its voice. Jennifer Rubin, writing at commentarymagazine.com, wrote that, "Republicans have the good fortune to be counter-punching against a White House experiencing a rocky start (between the tax cheats and the stimulus debate)." Liberals online, doubting the GOP tactics were working, cited a Feb. 9 Gallup poll that 67% of Americans supported how Obama was handling the stimulus compared to only 31% for the Republicans in Congress. "There’s no hope for them [Congressional Republicans]," explained DemFromCT on Dailykos.com. "But the public says there’s a great deal of hope in Obama, and every talking head blathering about what’s wrong with Obama is talking to the wrong people. They’re certainly not talking to the American public." After the stimulus debate, the next biggest topic on blogs and new media last week was, in its own way, another small slice of the mega-story of economic hardship. The second most linked-to story, a New York Times article called, "Seeing Straight Without Breaking the Bank," was all about how people could save money on eye glasses and eye care. Fully 15% of all the links dealt with the Times story. But almost all of the considerable attention from the bloggers focused on one aspect of the article-the mention of an online retailing company named Zenni Optical, which sells prescription eyeglasses for as little as $8. Zenni fans wrote comments that seemed like pitch-lines from a commercial. Enthused Tweetartz: "With Zenni, you will be seeing straight without breaking bank. Now, that is simply great!" "I know the folks there and wow… for them to be specifically mentioned here in NY times is great as they are recognized for their Prescription eyeglasses for only $8! and that is something that is hard to match!" exclaimed SEEKvibe. The third-largest story of the week involved another New York Times story chronicling the return at many Catholic churches of plenary indulgences-a practice that allows for the mitigation of punishment for sins. Some bloggers expressed confusion about the role and meaning of indulgences. "I didn’t really under stand too much about them," admitted Maria at Confessions and Contemplations. "There is so much about my faith and religion I didn’t understand, indulgences being one of them. I’d only heard how bad they were, that’s why Luther had a fit and left the Church." Others tried to clarify the teachings behind the practice. Nick Wagner at Teamrcia.com tried to offer answers about indulgences. They had never gone away, he explained. And while some clergy may have improperly sold indulgences in the 1500s, he explained, that does not mean it was a Church teaching to do so. The fourth story offered people a chance to reminisce about part of their childhood. CNN.com posted a story by Stacy Conradt of Mental Floss magazine about the history of 20 characters from the Muppets and Sesame Street. The story included tidbits such as the fact that the Cookie Monster was based on a 1966 commercial for General Foods and that the Swedish Chef was supposedly inspired by actual chef Lars "Kuprik" Bäckman after an appearance he made on Good Morning America. Most bloggers linked to the story without much comment, but a few took the time to share memories. "So who was your favorite Muppet?" asked My So-Called Blog. "I loved Statler and Waldorf & the Swedish Chef." "I have a bunch of Muppets I loved," Jill posted in response. "Kermit, Miss Piggy and Fozzie. Also, Animal! I can’t pick a favorite." "My nickname in middleschool was Fozzy the Bear because I was always constantly telling bad jokes," reminisced Tim C. at Chapel of Words. "I would’ve preferred Animal, because you know, he was cool. But I can live with Fozzy. When it comes to patron saints, mine is Fozzy the Bear." In the tradition of Fozzie–a fuzzy-looking creature who made a career of bad jokes and puns–Tim C. wrapped up his post with one of his own, connecting the Muppets to the ongoing economic crisis: "If you can’t bear to watch the fur fly any more on the economy – I highly recommend it." President Obama was once again a major subject in the top video last week, although in this case, he was upstaged by an unabashed admirer. The video came from a Florida town-hall meeting where Julio Osegueda, an extremely enthusiastic college student and McDonald’s employee, asked the President about his plans to help workers. The vivacious Osequeda was demonstrably grateful to be allowed to ask the final question of the session and by all appearances, pleased with Obama’s plans to give tuition tax-credits and expand health insurance. PEJ is launching the New Media Index as a companion to its weekly News Coverage Index. Blogs and other new media are an important part of creating today’s news information narrative and in shaping the way Americans interact with the news. The expansion of online blogs and other social media sites has allowed news-consumers and others outside the mainstream press to have more of a role in agenda setting, dissemination and interpretation. PEJ wanted to find out what subjects in the national news the online sites focus on, and how that compared with the narrative in the traditional press. While the News Coverage Index is comprised of primarily U.S.-based media outlets, the aggregators of blogs and other social media include both U.S. and non-U.S. blogs. In addition, stories that are linked to can be from non-U.S. sources. However, according to PEJ’s research over the last two months, the only non-U.S. news stories included in the top lists for Technorati and Icerocket have been the BBC (whose Web site is part of the News Coverage Index) and the Guardian.